THE highs and lows of summer are being played out on our sports fields, as professionals and amateurs don whites for cricket or tennis - meeting 'triumph and disaster just the same'. Or, perhaps, you're content to relax before television, or on a shaded terrace, just watching such seasonal dramas unfold - with light teas and refreshing drinks to hand. The summer brings its joys into full bloom but also, for life's balance, the crash of thunderstorms and tear drops of rain. Sport isn't only an enjoyable recreation that stretches our abilities, it teaches us to respect and work with others as a team. As one grows older, more wily 'court craft' balances the lost strength and speed of youth. It's the taking part that brings fulfilment. As in sport, with life - we all have our powers and weaknesses; are gifted with certain talents but lacking in others. We should show favour to those who exceed us but, also, grace in displaying our own abilities. In similar theme, there is an extract from our nation's favourite sentiments on our Poem page (see near top of right column). 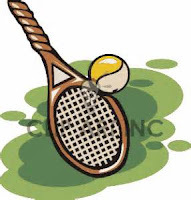 Tennis - amid the heat of romance - also features on our Story/Chapter page, which links up to our Memoir and full Books pages. There is much free reading to sample on our non-profit making website, while you rest between summer games and preoccupations. Copies of publications are also available (through Books page) on Kindle or in paperbacks sponsored by the British Arts Council.